That question was posed by Janet Weaver Yoder, who had read about efforts to collect dining hall history and stories for Eastern Mennonite University’s Centennial celebration in the Daily News-Record. Janet, born in 1925, grew up in a two-story brick house on Mount Clinton Pike across the street from campus [the house now houses programs in EMU’s Center for Justice and Peacebuilding]. Janet is the daughter of Henry D. Weaver, the college’s business manager for 29 years. First, there was the campus, nothing like the size it was now. Janet remembers the school as consisting mainly of the multi-purpose Administration Building, or the Crackerbox, as it was called, and some faculty housing. 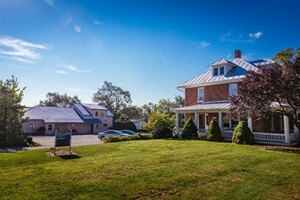 Surrounded by farmland and pasture, the campus was located about 1.5 miles away from Harrisonburg’s downtown. Cars were “few and far between,” she says. In 1936-37, 175 students attended the high school and two-year college (the school did not become a four-year college until 1947). In the 1930s during the Depression, all of the faculty tried to alleviate straitened circumstances. Gardens, goats, chickens, even a cow or two were common sights. Sometimes extra money could be made from selling produce. Henry D. Weaver was an entrepreneur. He saw that students needed somewhere closer to campus to buy clothing and food. But he was also concerned that students be happy and comfortable on campus. In 1937, Weaver bought the building next to the house, known as Kline’s garage. He subdivided this building into two sections with dry goods and groceries. One brother learned how to butcher in order to run a small meat department. Students had special dispensation to cross Mount Clinton Pike to go to the store. Janet remembers that her family worked in the store for long hours and sometimes would bring food back with them to eat while they waited on customers. Inevitably, their customers would be interested in the home-cooked food being eaten in front of them. In the 1940s, the Weavers created a small back room “with tables and chairs and an electric grill, where we cooked hot dogs and hamburgers and made egg sandwiches. There was a milkshake machine and we also sold ice cream.” The snack shop was open from 7 a.m. to 6 p.m. 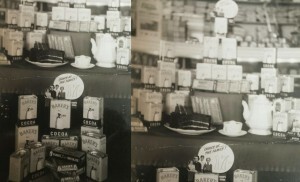 The store struggled through the years of World War II, when the rationing and coupon system made transactions difficult. In 1944, Weaver sold the store to a family. 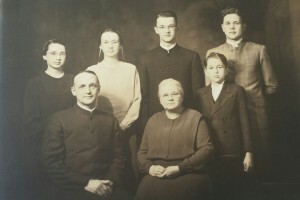 After about a year, that family sold the store to Lewis Martin, who continued the “department store,” offering Mennonite clothing and employing a seamstress who made bonnets and prayer coverings, as well as plain suits. A cocoa display in the Weaver’s store. As business manager, Henry Weaver was surely involved in oversight of this enterprise. Later he opened a laundry that served EMS, taking care that it was his own business he could run without the trustees telling him how to do it. As for what happened to the snack shop in later years, that is a story for you, dear readers, to share with us! 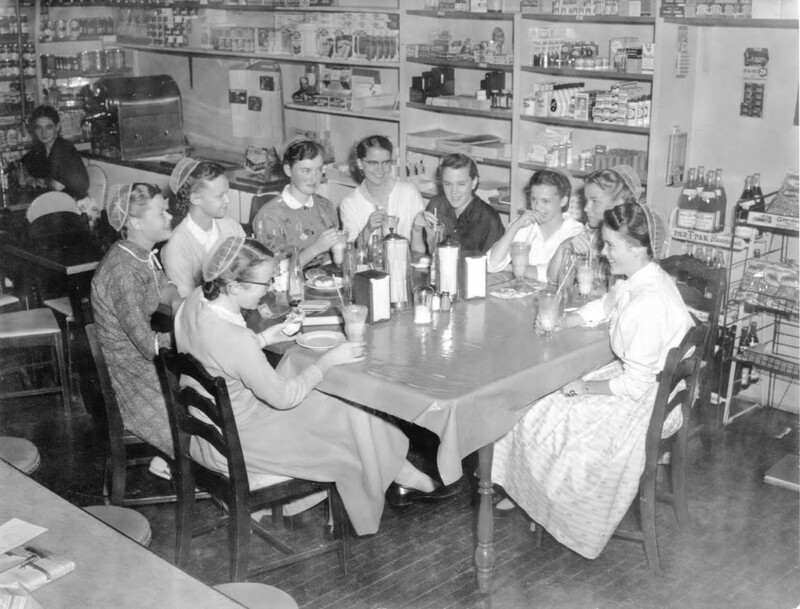 Click here to offer information or memories about the snack shop, from its early days through the 1957 move to campus proper. And stay tuned for an interview with longtime Snack Shop manager Helen Ours. I remember the Snack Shop well; always a favorite place to go. I was at EMHS from 1956 to 1961. My brother-in-law’s parents lived in the house next door. I need to correct the idea that the food which the clerks ate in Weaver’s Store between customers was “home made.” That was our problem. Since we could not go home to eat we made snacks out of what was available in the store. We ground hamburger fresh for each customer so it was easy to have a little extra to put on the grill in the back room. We would open a package of rolls, ketchup and whatever and have a nice juicy hamburger before there were “hamburger joints” across the country. When our school friends begged, “Daddy” set a price and business grew. great glimpse into EMU history! Thanks Janet for sharing your memories! I remember the Snack Shop as the place where I had my first date with my late wife in 1956. Then we came back to EMC in 1966 for me to finish my degree and we lived there for two years.